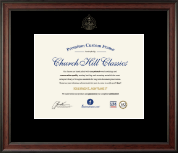 Choose one of our dental certificate frames, then customize and make it your own! Pursuing a career in dentistry has long been your dream. You worked hard to earn your degree and your academic credentials in the field of dental medicine. Now it’s time to show off those professional achievements in certificate frames, award frames, and document frames bearing the official seal of dentistry. 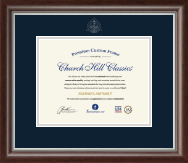 You’ll inspire confidence in your patients and clients when you hang our handcrafted, custom degree frames on your office wall or in your waiting room. Interested in a custom frame embossed with a gold or silver dental insignia for your new job? 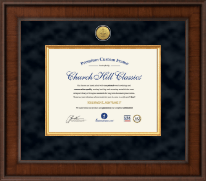 Or maybe you’re looking for a degree frame with a gold engraved dentistry logo medallion as a special grad gift? Our online custom framing tools are easy to use when making dentistry frames to suit personal style and decor. 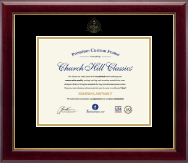 Need special certificate frame sizes? We’ve got them. And you’ll love the finished product—we guarantee it!